When Elad I. Levy, M.D. ’97, M.B.A., FACS, FAHA, was a student at the George Washington University (GW) School of Medicine and Health Sciences (SMHS), his mentors taught him to challenge dogma and to make the world of medical knowledge better than how he found it. He took these lessons to heart, and since beginning his career little more than 10 years ago Levy made paradigm-shifting contributions to the field of stroke treatment. For these contributions, Levy was awarded the Distinguished Alumni Achievement Award at the 79th Annual Alumni Achievement Awards ceremony on Sept. 24, 2015, as part of the university’s Alumni Weekend. An alumnus of the SMHS M.D. Program Class of 1997, Levy completed a surgical internship and his neurosurgical residency at the University of Pittsburgh, followed by a fellowship in endovascular surgery at the State University of New York (SUNY) at Buffalo. Today, Levy serves as professor and chair of neurosurgery and professor of radiology at SUNY Buffalo. He is the director of stroke research, co-director of Kaleida Health Stroke Center and Cerebrovascular Surgery, and director of Endovascular Stroke Treatment and Research. A leader in stroke research, Levy was the principal investigator for the interventional, or surgical, component of the groundbreaking Stent-Retriever Thrombectomy after Intravenous t-PA vs. t-PA Alone in Stroke (SWIFT PRIME) trial, recently published in the June 11, 2015 edition of the New England Journal of Medicine. This trial produced strong evidence that the use of a retrievable stent to pull a clot out of blood vessels in the brain, in combination with clot busting proteins, produces better patient results than the use of clot busters alone. This, according to Levy, has permanently changed the way we treat stroke. “We’re no longer living in a world of stroke rehabilitation. We’ve moved into an era of stroke intervention,” he told the audience at the ceremony. Patients need not be disabled, paralyzed, or killed by strokes, he explained, as retrievable stent technology and clot busters can allow physicians to reverse the damaging effects of stroke and put patients on the path towards excellent recovery. Levy warmly thanked his classmate, Steven D. Weisbord, M.D. ’97, M.Sc., FASN, FNKF, who nominated him for the award, and his wife, Cindy, whom he met as a medical student. 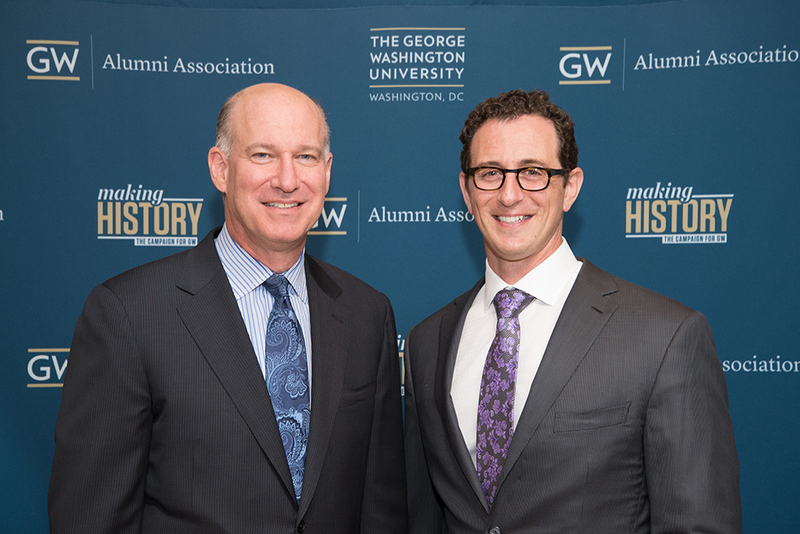 He also thanked his mentors at GW and the entire GW community that inspired him as a student. “Thank you for this most prestigious award, which is more reflective of the merit of this institution than it is of the recipient,” he said.